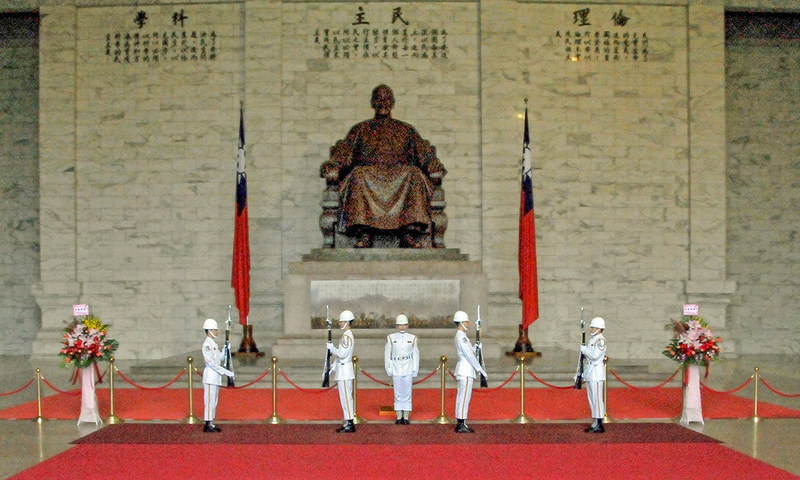 Every hour during the day, guards change in front of an enormous statue of Chiang Kai-Shek in Taipei, Taiwan. Someday soon, the statue itself will change. Chiang Kai-Shek became chairman of the Republic of China in 1928. In 1949, after his forces were defeated by the Communists, he removed himself and 2 million Chinese to Taiwan, an island 112 miles from the mainland, where he established a government in exile and ruled with an iron fist. He maintained martial law and initiated the “white terror,” in which 140,000 Taiwanese were imprisoned and at least 3,000 executed for suspected opposition to his government. After Chiang Kai-Shek died in 1975, the one-party government constructed a building in his memory at the east end of 60-acre Chiang Kai-Shek Memorial Park. The white Memorial Hall is covered by an eight-sided roof, the number eight representing prosperity and good fortune. Eighty-nine steps, representing Chiang Kai-Shek’s age at death, lead to an imposing hall featuring a 32-foot tall bronze statue of the seated ruler.